Back pain is very common and most people will suffer one or more episodes in their lifetime. In many cases it starts suddenly and gets better quickly. 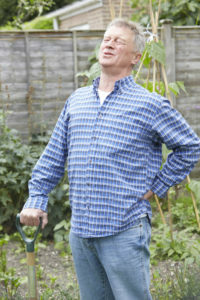 However back pain can be debilitating and persistent. It can also be associated with other symptoms such as leg pain or sciatica. There are many types of back pain. If you want to know more about the different types of back pain sign up to our Silver membership. We have listed in diagnoses the common types we see but it is always best to seek advice if you are in pain and not improving. Successful treatment is dependant on finding out the type of back pain you are experiencing. At attend2health we are able to diagnose where your pain is coming from and create a tailored treatment plan to relieve your suffering. 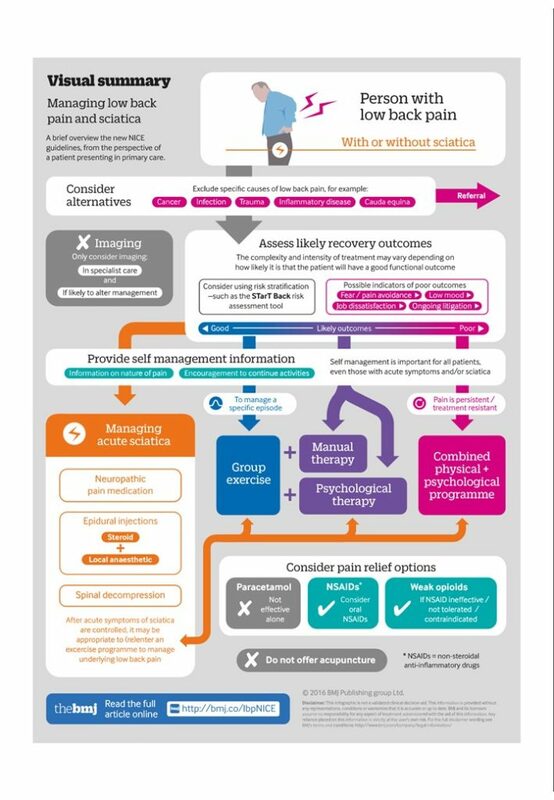 The British Medical Journal have produced this great info graphic that we use during an examination to make sure the correct treatment is given. This is when the joints in your spine become stiff and locked and cause the muscles to go into spasm to protect the area. It can also be known as mechanical low back pain as generally the nerves are not involved. Causes of this include poor posture, prolonged sitting or even muscular tension due to stress. This can also be called a slipped disc and it is where some of the outer fibres of the disc tear and cause the disc to press against a nerve. When the nerve is aggravated it causes pain down one or both of the legs. If the pain goes down both legs and you experience problems going to the toilet then you must seek immediate help. When the disc is involved the pain can be quite severe and quite often it is worse in the morning when the discs contain the most water. This can present in a very similar way to a prolapsed disc with pain going down the leg but it is caused by the piriformis muscle in the buttock being extremely tight and pressing against the sciatic nerve there. By releasing the piriformis the pain can be relieved. As we get older the discs narrow and you can get a little bit of bony growth from the vertebra (osteophytes.) For most people this can just be felt as a bit of stiffness in the spine but for some people it can prevent them from walking long distances and cause pain into the leg. Upgrade to Silver membership to see more. 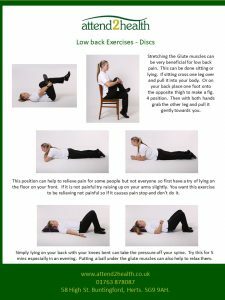 Here is an example of some of the low back exercises we reccomend. With Silver membership in this section are lots of different exercises to help your back. 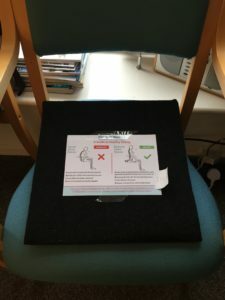 There are lots of things that can help the back including a wedge cushion to sit on which will make sure your hips are higher than your knees.